INDIANAPOLIS, Ind. – Tony Kanaan knows what it feels like to be the favorite to win the Indianapolis 500. It’s happened more than once. The 37-year-old Brazilian driver also knows what it’s like to fail to meet those expectations each time. This year, heading into Sunday’s 96th running of the Indianapolis 500, Kanaan is not considered the favorite. That honor goes to pole-winner Ryan Briscoe. But that’s OK with TK. He knows he has the car, the experience and the ability to win. Kanaan first race at Indy in 2002, starting fifth and crashing out in 28th-place as a rookie. 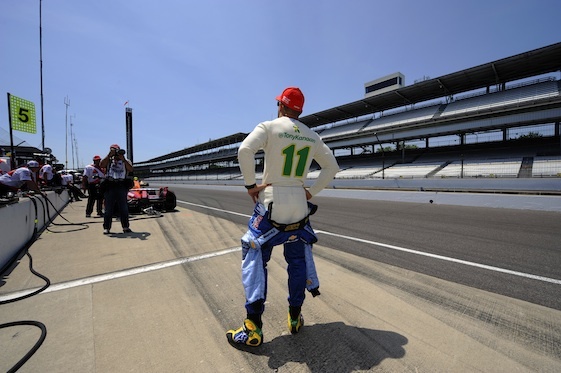 Since then, he has competed at the Indianapolis Motor Speedway every May, winning the pole in 2005 and starting worse than sixth only the last two years. here, but there have also been crashes and poor runs that have kept Kanaan from getting any closer to an Indy victory. 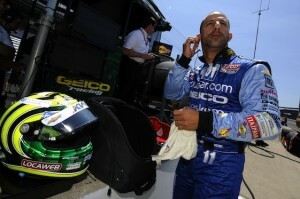 One reason Kanaan is so relaxed this month is that he considers the race a toss-up. “It’s going to be a hot, hot day,’’ he said. “I think anything can happen with the new cars and the new engines. I don’t think anybody ran a full 500 miles in a row (in practice). So we’ll see. Kanaan, who can be intensely competitive and impatient, credits the late Dan Wheldon, a two-time Indy winner, including last year’s 500, with his new attitude. Kanaan still misses Wheldon, who was killed in a crash in Las Vegas last fall, a lot. He would love to win on Sunday and dedicate that victory to his friend. “I said it in the beginning of the year, the two toughest races for me were going to be St. Pete, because it was the first one and the place where Dan lived, and this one where he is the past champion,’’ Kanaan said. “He is a dear friend and I hope after this race I can put a closure on the suffering, how much I suffered that he is not around, and then move on and remember the good times that we had. “It is going to be very emotional. It will be very emotional on Saturday at the public drivers meeting where he was supposed to get his trophy and his ring and on Sunday. It’s going to add that stress to this weekend. Well said Tony…I live 15 minutes from Nazareth Pa and met you both for the first time at the Nazareth Speedway. Dan was a true gentleman and also showed the perfect attitude towards the fans as well as an obvious love for the atmosphere at the venue !! His type of characteristics are what turned me into an avid (my wife labels me as obsessed) IndyCar fan. Bless you and ALL the drivers and have a safe race!